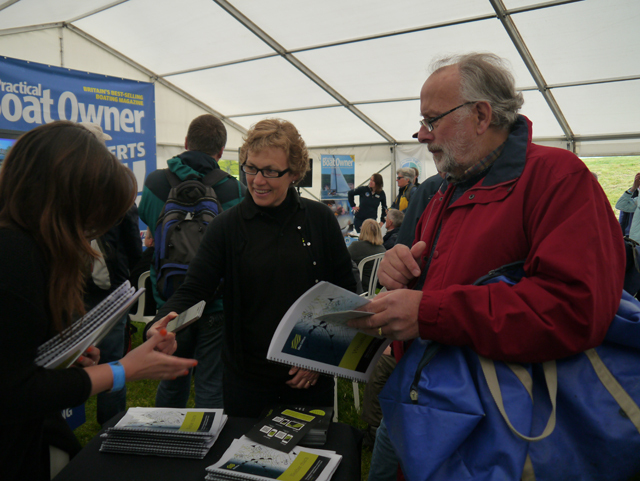 Hundreds of visitors to the 38th Beaulieu Boatjumble enjoyed free expert advice and demonstrations at the inaugural PBO Ask the Experts Live! event. The free expert advice service from Practical Boat Owner magazine’s pages sprang to life at yesterday’s Beaulieu Boatjumble. Sixteen marine industry experts took part in the first ever PBO Ask the Experts Live! event with topics encompassing ‘Be your own surveyor’; using tablets for navigation; essential sealant tips; how to read the skies; a liferaft demonstration; crowd-sourced charting; how to sail greener; engine trouble-shooting; preparing your boat for long-distance cruising; basic fibreglass skills; professional paint job made easy; polishing and restoring faded fibreglass; corrosion causes; lifejacket advice, a cruising clinic; and essential radar skills. Held at within the scenic grounds of the Beaulieu estate in Hampshire, Ask the Experts Live! came about from a question that many of our visitors asked at the previous two jumbles, where our project boat Hantu Biru occupied pride of place opposite our regular stand, gleaming in her new paint. ‘How did you do that?’ began the conversation. We explained the process and credited our paint expert Richard Jerram for his advice and his employer International Paint for the product, but the seed was planted for a demonstration of how it was done. This small-scale idea has grown dramatically. From a painting demo it developed into a day-long event with 16 different presenters, each experts in their own areas of the marine industry, all giving up their time for free to answer your questions. All bar two of them got up on stage during the day to present or demonstrate on topics relevant to boat owners. The PBO team also exhibited Hantu Biru for a third year. For those who were unable to attend Beaulieu or who missed a talk, however, all is not lost. We filmed the whole event and will soon be posting the videos online, so watch this space! Boatjumble visitor James Mason, of Lymington, attended the lively demonstration by International Paint’s Kate Moss and Roger Bolton. James said: ‘I thought it was superb. The practical demonstration about how the layer the paint on was very good. ‘I’ve been to a few paint talks but this was a pretty interesting one, with technical explanations about why certain techniques work well. ‘It was very useful. I’ve also spoken to the lady from the Met Office, it was good. Met Office weather forecaster Penny Tranter said: ‘The Met Office found it very good actually. We’ve had a lot of people who are very interested in the weather in terms of how it affects their sailing. PBO forumite and contributor Wil Bailey said: ‘Best value of the day, I reckon, was the multiple ‘Ask The Experts’ sessions in the PBO marquee, where I was able to get ‘real world’ answers to some current thorny probs…. each one of which will save me time and money worth rather more than the price of admission. Boatjumble visitor Nigel Christopher, who keeps his Hurley 22 at Poole Harbour, Dorset enjoyed the demonstration on sealants by Gareth Ross of Sika. Mike Hannam, community safety resources and development co-ordinator for the RNLI, said around 50 people attended their safety advice stand within the PBO Ask the Experts Live! marquee to ask questions about lifejackets. Guy Malpas, of the RYA Active Marina team, said: ‘It’s certainly been a success. It’s been busy all day. Stuart Carruthers has had a lot of interest in the SafeTrx app and questions about general cruising. PBO Editor David Pugh said: ‘It was great to see so many readers visiting our debut Ask the Experts Live! event. 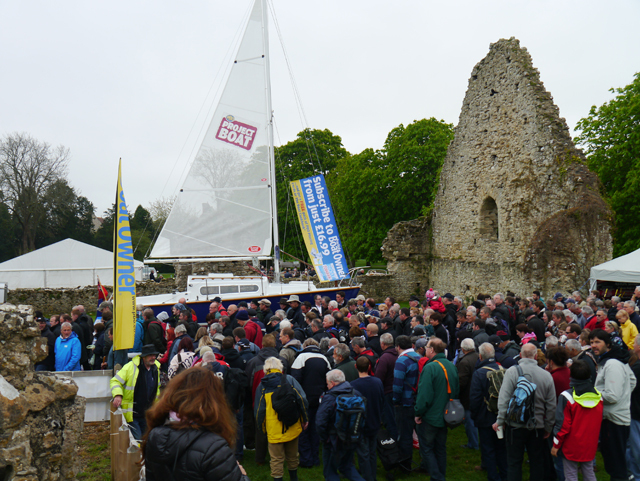 A forecast of showers for this year’s Beaulieu’s Boatjumble, didn’t deter more than 7,000 visitors who attended the event which remains one of the largest outdoor sales of boating items in Europe. The day remained dry, albeit chilly and the event fields were bustling with people eager to spot a bargain among the hundreds of stands offering everything needed to stay afloat for another year, from anchors, chains, rope and fenders, to outboard engines, sails and clothing. More bargains were to be had in the Truck Traders area which offers amateur jumblers the opportunity to clear out their lockers and garages of boating bi, setting up shop from their car boots. In the Boatmall visitors could browse for new trailerable boats, clothing and the latest hi-tech sailing gadgets while in the Boatmart an array of used boats, from classics to nearly new, were up for sale. Beaulieu Events Manager, Judith Maddox, said: ‘Despite a chilly north wind we were delighted with the day’s good visitor numbers and a lively selling event. The 2016 Beaulieu Boatjumble is set to take place on Sunday 24 April. Stephen Munn, commercial director for Beaulieu, said: ‘Beaulieu Boatjumble has been going for many, many years, there’s always a lot of bargains to find here. The weekend after next, from 9-10 May, PBO project boat Hantu Biru will be afloat at the inaugural Poole Harbour Boat Show, so please come and see us!